This page will deal with the military/security situation in Taldou (site of the Houla massacre) as it played out in space (see also Houla:Scene) and in time (see also Houla:Timeline). When UN Observers and Western media entered Taldou on May 26 and 27, it was clearly rebels in control of everything but a strip at the south end of main street. Channel 4's Alex Thomson entered what he called "rebel-held Houla" from the south, taking Main Street up north to the center of town, passed off from army handlers to rebel escorts over a tense no-man's stretch. UN Monitors did about the same; all this can be seen on video they made, with stills shared on this page. On the morning of May 25th, everyone agrees, Taldou was the one part of al-Houla not in rebel control. The change seems to have happened on May 25, the same day as the massacre. That sounds fascinating, doesn't it? The details of what they describe, who attacked who, where and from where, and when, will be explored below, with multiple versions mapped out side by side and compared, along with the different kinds of supporting evidence for each. The material here, mostly from late 2012, is detailed but fragmentary. Much more is covered on the rambling talk page and not yet incorporated "up-front." Rather, highlights of the video evidence findings of this two-page discussion were later refined into this external article, and essay 7 in this later report: The Houla Massacre and the Battle of Taldou: The Digital Witnesses Have Their Say. 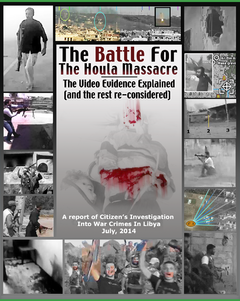 Later, that was expanded with more visuals, and fuller and updated explanations, into the July, 2014 report The Battle for the Houla Massacre (cover inset). Only now at the end of 2014 is this page where it all started getting some overdue revisions. Monitor on Massacre Marketing How Terrorists were Given Al-Houla in Response to Their Massacre There May 23, 2018. This gives some partial review of the findings here. 2.2 From the South or the North? 3.2 From the South or the North? Below is a map/graphic, and beneath that explanations of the security positions that would usually give government forces the upper hand in Taldou. Whether this held on and throughout May 25 is a central question to be addressed on this page. For reference, the bright red dots represent reported, confirmed, or possible massacre sites. 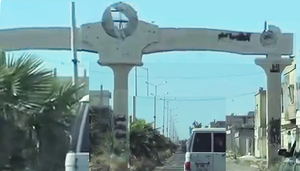 The Clock Tower Post Clearly taken by rebel forces (abandoned and open to them on May 26 as "Freedom circle"), acknowledged by the UNHRC's Commission of Inquiry (CoI) and media as clearly having changed hands, not mentioned in rebel accounts. It was clearly abandoned by the army, sandbagged sniper positions, APCs, a tank, left in rebel hands on the following morning and into the 27th as UN Monitors and a select few media cameras came in. The local headquarters of the Baath party were also reportedly at this location, and constituted one of the rebels' targets there. Military Intelligence HQ Clearly overrun by the rebels, acknowledged as "likely overrun" by the CoI, not mentioned by rebels one way or the other. Seem after, it's been torched inside, and two charred APCs, blue in color, sit outside. The Qaws Mobile security post, reportedly based, usually, at the arches (Qaws, pronounced kwaws or kawaws, once transliterated in an opposition video as "car wash."), remained in government hands, the CoI decided. It probably did, but being a mobile unit, it's entirely possibleit drove away from its post in order to do so. The post was seen in the following days, driving, escorting UN monitors and journalists. The arches were shot full of holes and lightly blasted by then. National Hospital The Army reportedly had a presence here that's worthy of more study. Non-rebel versions say this post, along with the hospital, and homes across the street from it, were overrun on May 25. The Rebels and the CoI disagree. The "Water Authority/Company" Forward Army Base This is the high ground from which any government shelling would likely have come. It had a small military force seen in satellite images reportedly taken May 26. (more details coming). It too was taken, by some accounts (see "Arifah". Other and compelling evidence suggests, however, that it was attacked, perhaps pinned-down in defensive mode, but not overrun (at least not as of sunset). The rebels/opposition and the CoI don't report any of that, the satellite image shown by the BBC doesn't show any sign of havoc there (but they may have shown the wrong day by accident), and there are no other known images of it close-up to clarify the issue. The north-south divide is of prime importance (the posts marked in white above vs. those in orange). The UN's CoI amended the rebel story of, vaguely, a total government invasion and FSA retreat. By the time of their oral update in June, 2012, they had decided on a version in which the rebels actually conquered the two northernmost security posts. This would gave them open access, the CoI acknowledged, to one set of massacre sites down Saad Road, if they had wanted access. But the continued government presence at all three southern posts would have protected all crime scenes, by either direct control of streets, or by proximity allow detection and the use rifles to pick people off if they attacked the Saad Street homes. Therefore, they decided all massacres were committed by government forces behind the cordon they held against the rebel advance, at once shielding the areas, or keeping out the rebel defenders, and conducting a slaughter within them. In general, the events were described by rebel fighters and allied activists as a one-sided massacre by forces loyal to the Syrian government. Both sides have their ways of agreeing that the opposition was generally predominant in the al-Houla area, and maybe even the northern part of Taldou itself, prior to May 25. But the center and south of Taldou was until then under government control. Activists say the army remained in control of the city, and expanded their reach by shelling it from a distance and chasing away their rebel opponents. Their allied Shabiha militias, culled from surrounding Alawi and Shia towns, were then allowed in to do the dirty work of slaughtering families pinned down in their homes by the shelling. While most of what the Free Syrian Army claim they did in Houla was retreat, there is acknowledgment of some fighting on their part; an isolated clash at a government security post, or perhaps at a couple of them, perhaps provoking the shelling. They do not acknowledge gaining control of any of the posts guarding the town - in the end they just ran away under fierce government shelling. By the time they could return, the massacre was done and the bodies left behind for them to discover and exploit on Youtube. As explained at the timeline page, there are consistent features with inconsistent sequencing; Friday prayers, a planned Friday protest, an impromptu fight at a checkpoint (or several), and a shelling attack followed by the Army/Shabiha invasion. The first portion alone has at least three versions, as passed from activists to the Western media. In the mention of fights or skirmishes, at one checkpoint (more commonly mentioned) or several of them, there is no indication that any of these were won by the rebels, nor any posts overpowered and overridden. The Syrian military remained clearly in charge, and so the massacres that followed were either their work or done with their approval. From the South or the North? But this astute observer also noted a move from another direction. "At the same time, another group came from the army checkpoint at Mussasat al-Miyah." It's not certain where this "Mussasat Al-Miyah" is, but Saad Road only runs two ways, to the water (south) and the city (north/northeast). "The group comprised around 30 people. They entered into the street where the massacre took place. I could see them through the trees, but not very clearly. They met up where the street begins. The vehicles also gathered there. The army came to the site and kept the street entrance under surveillance." He was chased off then and didn't get to see which force was responsible for the killings. Major Jihad Raslan, Free Syrian Army, and another Der Spiegel interviewee, is the only other one mentioning this apparent move from the north (and not the one from the south). Around 5:30 PM, Raslan says, "I saw the security and military forces. They were accompanied by a group of civilians and members of the Shabiha militia. They came from the city’s Mussasat Al-Miyah district and headed towards Sadd [sic] street." "The street is considered to be a safe place because you have to pass through numerous checkpoints in order to reach it," he added, showing his alleged prior naiivity. The United Nations' Commission of Inquiry is one of the firm-set windows the Western public has into the massacre. But the news media, governmental investigations, (predominantly those arrayed against the Syrian government), and other mostly-Western sources, have helped shape the record on the Houla massacre. This record generally conforms to the opposition version, but with some noteworthy differences. The vantage point of the Water Company should have been clear onto the Abdulrazzak and the Al-Sayed family sites. That said, it is unlikely that those positioned at the Water Company could have discerned between a farmer with a rake and a fighter carrying a gun, unless viewing through a sniper scope or similar. The same cannot be said for the National Hospital checkpoint which, if actively manned, could easily have made such a determination. [...] Government positions at the National Hospital and the Water Company appear to have had a clear line of site to the Abdulrazzak and Al-Sayed homes making access for perpetrators not aligned with the Government difficult. This difficulty might have been overridden completely; again, the allegation is that it was not actively manned after the rebel conquest there. The hosipital was in an abnormal state - belching smoke - by about the time of the massacres across the field. The army was in charge in the morning, so they must have remained in charge during all of the night's fighting, they reason. The Qaws (arches, the old city gate) represented the "front line," in their minds, after the points north were overrun. The one position that must hold for the south to be in government hands is the one post that could simply move out of the way, but they don't think it did, because it was (back?) there in the morning. 44. Accounts varied as to the location from where the perpetrators entered and how they exited Saad Road. To the extent verifiable from accounts and satellite imagery, there were no checkpoints anywhere on the street. Both pro- and anti-Government forces could have accessed the crime scenes. Opposition activists managed to reach the site of the Abdulrazzak killings in broad daylight - while the clashes and shelling were reportedly ongoing. This fact indicates that routes to the Abdulrazzak crime scene were not closed to them. Anti-Government forces could also have accessed the scenes through fields, or in small numbers. While the National Hospital checkpoint is 500 meters away, the CoI was unable to determine whether that checkpoint remained actively manned at the time of the crimes, and even if manned, whether it would have been in the position to stop a small group of armed persons from accessing the Abdulrazzak homes. The checkpoint was, however, manned by Government troops at the time the UN observers arrived the morning of 26 May 2012. A rebel attack in Taldou was reported by some of the alleged witnesses, is supported by some evidence. and partly acknowledged by the UN's investigators. The CoI has drawn a front-line somewhere north of the Qaws mobile security post, with everything north in rebel control and everything south still in government hands. Therefore, special emphasis will be made below on the contested victories south of that purported front-line. The alleged rebel attack was not spontaneous, but well organized and pre-planned. The formation of the Arabad bin Sarieh battalion was announced just a few weeks before the offensive. One alleged witness, "the Rebel Defector", who claims to have been involved in the operation, said his activist contacts spoke of it in advance. "Three days before the massacre, the gunmen had been discussing something that would happen on Friday, saying that it was something "special and big." "
Roundabout, with army sniper positions. The reason for this isn't stated, but these three posts, along with two others (the Qaws and the National Hospital on Main Street) were reportedly struck and overrun on May 25, giving the brigade and its allies unfettered access to the city. There is surprisingly direct video corroboration, from opposition videos, of some aspects of this alleged rebel attack, as explained below. And there are other parts not so bolstered: the firing of mortars, or the use of truck-based heavy machine guns, the conquest of any security post, the capture or execution of any soldiers or anyone else, or the Islamist massacres themselves. All we see is body-recovery vehicles, with motorcycles audible, and lightly-armed groups on foot. These are seen shooting machine guns and sometimes RPG launchers at unseen targets that, with some map knowledge, often correspond to government security posts. That doesn't mean that's all that happened, it's just all the activists have chosen to share with us. And even that was, arguably, too much. Various sources of satellite imagery have been presented, by the Huffington Post, for example, as proof of government shelling of Taldou. The imagery avoids the government posts and massacre sites, focusing on a stretch of Main Street and the mosque/mass grave area. The former suggests nearly all building damage is right along the main street and perhaps the connecting streets. This is hard to explain with the distance shelling they cite, and more in line with the violent invasion rebels themselves are accused of. Further support for a street-level attack comes from on-the-ground imagery suggesting mainly walls, and not roofs, were holed by the "shelling." Bullet holes were also scattered on the walls, and trees in the middle of the street were mowed down. The picture is less like the "shells crashing down" described by the opposition and the Western media than like the aftermath of the Libyan rebel assault on Tripoli, or Sirte, in 2011. Truck-mounted heavy machine guns and rocket-propelled grenades prevailed there, horizontal "shelling," fired into the sides of buildings from foot or truck beds, on or just off the main streets. 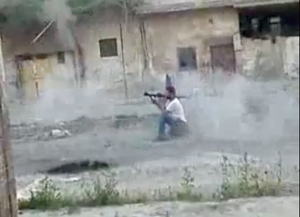 Some of this exact activity - rebels firing heavy weapons in Taldou on May 25 - can be glimpsed in the most famous video supposed to prove government shelling, in Houla: Saad Street RPG Incident. Clearly filmed on May 25, at about 6:15 PM, a cameraman drawn to North Saad Street by a blast witnesses some dead being loaded in a van, and then another blast is heard nearby. 25 frames later we see a rebel-looking man who apparently just fired an RPG at something nearby. He falls from the recoil, rises, and walks walks casually by the cameraman, not even hiding the rocket launcher clearly held at his side. Two more blasts can be heard as he proceeds south down the street, as ignored as possible by the aftermath managers, for a total of four apparent instances of horizontal "shelling" in that short span of street and time, by just one of the reported several hundred rebel attackers. 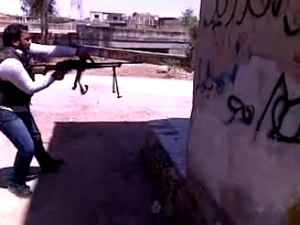 More Free Syrian Army rocket and machine gun activity, if not certainly on May 25 then quite likely so, was captured on video by the fighting brigades themselves. (see talk page until incorporated). By their assessment, the building damage wasn't necessarily caused by artillery, even light, which only the government was believed to have. "Accounts" notwithstanding, weapons the rebels are known to possess - truck-mounted anti-aircraft guns, rocket propelled grenades, and all kinds of mortars - could be responsible for what they saw. How the damage was also horizontal and focused along the main streets strengthens that explanation. Furthermore, the opposition narrative does almost nothing to explain the use of machine guns, especially against government posts; the Shabiha are reported as firing into the air in celebration, but otherwise the shooting described was inside homes. Some alleged witnesses reported that rebel forces set fire to the national hospital, other security posts, civilian homes, and crops, and at least one living soldier they had captured. If those events occured, it's expected that some smoke would be seen on the scene, and indeed, plumes of smoke - from the "regime shelling" it's said - appear in many May 25 videos. MIHQ burning, late afternoon:  The point of filming is the north-west of town, or maybe as far out as southern Kafr Laha, looking southeast over the town, towards the giant water tower by the elevated "water company" forward Army base (see the talk page). In the span between, huge plumes of smoke rise from something which seems to line up with the middle part of main street, somewhere right around the military intel HQ, which was overrun and torched. Since no one contests that, the discovery is not earth-shattering, but interesting. The image below shows the whole span, stitched from different frames and enhanced for sharpness. Less visible in the still here, but evident in the video, is a lesser source of smoke, apparently a bit to the south of there, seeming less contained - possibly fields burning. In the distance, right of center is a field running up the hill that looks rather blackened, halfway between the Army post and the possible Alawite village of Al-Shumeriyeh. The "rebel defector" describes the northern part of the alleged operation in some detail including names. According to him, it began at the checkpoint on the northern end of main street at the roundabout with the clock tower. Part of this checkpoint was an observation point on the roof of the Baath party building. Just after the Friday prayers, Rebel units started to take this under fire from the north-west across the river. This was intended to distract their attention from the real attack which happened "from the east" likely meaning the road leading from the east to the roundabout. On Friday, after the prayers, a unit of the fighters gathered in the northern district of the village, which is located beyond the checkpoint, next to the place with the clock. […] The northern units opened fire to distract the attention of the military post (checkpoint) on the place with the clock. The building shadow, slight on the north side and longer to the east, suggests a solar azimuth of 210-235 degrees, yielding a broad time frame between 1:00 and 1:45 PM, more likely somewhere in the middle, or about 1:30 PM as specified by "Arifah." The attack reportedly escalated after this, but didn't overpower the post completely at that time, being a distraction maneuver to allow FSA fighters to slip past to the south, where the Abdul Razaq massacres occurred over the late afternoon. But it wasn't over up north. "Arifah" told ANNA news "At 7:00 pm, Al-Farouq brigade, led by Abdulrazak Tlass, of the so-called “Free Syrian Army” arrived." He had more than 250 armed men with him from the city of Rastan, he also had 2 other groups with him one from Al-Qabo village, led by Yehya Al-Yusef, and another from Falla village. With this force, they conquered the roundabout post for good, and by 8 PM had trucked the recovered massacre victims back to their mosque in the north of town. 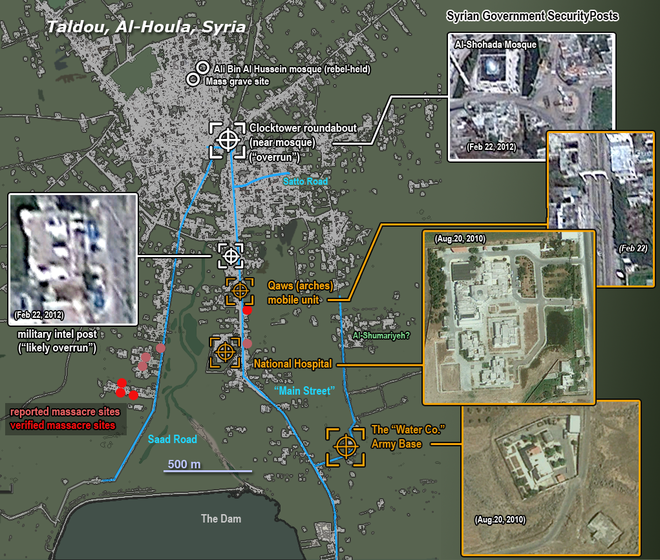 While the people at the checkpoint at the roundabout were distracted by the shooting from north-west, they were attacked by units coming from the street leading to the roundabout from the east and/or the northern "main street by-roads", while the southern "main street by-roads" units attacked, took-over and burned the military intelligence HQ, according to the "rebel defector". Between the roundabout and the military intelligence headquarter half-way down Main Street, there are four roads leading to main street. 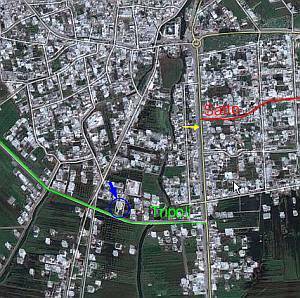 The alleged witness describes that he was part of rebel units which gathered on the one road coming from west, which he calls Tripoli road (marked green on the map). He also says that additional units gathered on at least two, but likely all three roads coming from the east. The most southern of the three leads to the district Al-Nasiriyah which he mentions as one gathering point. Another one on "the road leading to the confectionary factory" which could not be clearly located by us, but likely is the middle road coming from the east, as he also describes what happened on the northern one which he calls Satto Road (marked red). On this road, he said, rebel units gathered which he names as mostly from the Al-Hassan clan - a clan of local bandits - and led by one Nidal Bakkur. The alleged witness says that the massacre itself was committed "mainly by the Al-Hassan clan". The units gathering on these streets in total are named by him as "the Salafi unit of Khaled Abdul Wakhed, the unity of Abdul Malek, the unit under Saleh Nidal Bakki, even more under the command of Haysam Al-Hassan, as well as units from Ikrim Akrab, Kafr Laha and also a unit of the valley in Dahab. Besides these (units), there were still a large amount of armed strangers." As noted above (Taldou burning), the headquarters, or something on the same visual line as it, was pouring smoke by late afternoon. As seen the morning after, it sure looks burned-out and abandoned, like the two armored personnel carriers parked out front. Satellite imagery from February shows these parked out front back then, sea blue at the time. One of them is shown after in the inset image, composited from two video views. The other is also present, and in a similar state as of May 26. One Associated Press report mentioned this: "A video released by the U.N. team in Syria on Sunday ... showed two destroyed armored personnel carriers – suggesting that local rebels put up more of a fight than the activists acknowledged." 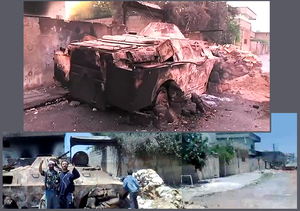 In another one of the series of battle videos some of the rebel fighters are seen celebrating in front of the vehicles. It's not certain this is rebel graffiti from after the victory, but it's on the outer wall of the MIHQ, next to the northern APC. The inset at right is from the May 26 UNSMIS video, so it's not from any later than that. At this writing's translation space so far the word Emir (prince) is readable, and the names Hafez and Bashar (al-Assad), context unclear. The main image shows how rebels left it as they struck victory poses over the summer - so it's probably not "regime" boasting they've left, and probably does not pre-date May 25. Alleged witness "Arifah" goes into some of the southern part of the operation, in the fringe of Taldou, where the forward Army Post at the "water authority" and the army post at the National hospital normally held sway. According to "Arifah," both of these were also overrun that afternoon. Like with the Defector, her testimony went through several stages of translation before it arrived in English, so it is a bit confusing. Here, the better quality German text it was translated from is used as source. She also mentions the group led by Nidal Bakkur and the Al-Hassan clan, also known as Al-Hallaka. The plan was to first attack/take-over the observation post at the hill to give free way to the operations in the city. Nidal Bakkur was monitored communicating with foreign fighters who should do the task of taking over that post. This was accomplished at around 3:30 pm. Bakkur and his group(s) took care of the roundabout and shortly after the army post on the hill was conquered, the military intelligence HQ and the checkpoint on Main Street had also fallen. At this point the city including the southern outskirts was in rebel hands. Then after taking over the checkpoint they stole the weapons and ammo which were in it, took these to another area, and began distributing them amongst themselves. Then they immediately set fire to the checkpoint, nearby hospital and the woods behind it, completely burning down the trees. Interestingly, there seems to be video verification for this, posted by the opposition activists who have worked so hard to contradict her version. The clearest proof was posted by Taldou-based activist Monther Hrfosh, on May 25. There’s an apparent title mix-up involved with two of his videos that day, where this video of the hospital burning is called (translated) "Hula heavy shelling of the city," while the one showing firing near the alleged shelling position is called "Hula targeting the hospital 25-5-2012" This one seems to be filmed from 340 meters off Saad Road, behind the orchard above the homes on alley 1275W (or around here on Google maps). Shadows seem to fall just north of the 292.5 degree line, suggesting a time of 7:07 PM local, 31 minutes before sunset. While the hospital buildings themselves are not visible, and the title of this video doesn’t mention a hospital, it's what the video shows (inset graphic - On the rotated satellite images, north is left). Note the unusual and consistent row of tall trees just inside a long, low wall with a unique bend (marked blue) near the north end. South of that line, the wall is oriented differently and catches more of the north-of-west sunlight. The water tower is visible here (marked red) and perhaps two parts of the hospital itself appear, their rough footprints (where they meet the ground) traced in purple and green below. The green-marked structure is apparently the one inside the white box in the lower image, perhaps some kind of vent, and possibly the origin of much or all of the smoke. Contrary to what Arifah (and the video) says, apparently the trees were not burned down. The selected "confirming" view was not conclusive, and is slapped down by a May 27 video, taken from behind the hospital not far from Hrfosh's position, shows the scene at 2:51. The long wall is frequently visible, but at that moment we can see its north end, and a full row of trees lined up perfectly with the water tower. So "Arifah's" claim that the trees were "burned to the ground" is apparently incorrect, if she was referring to these big trees. The smoke over the hospital is rather light in color, and could result from an ordnance explosion rather than a fire. In fact, the video shows the cloud not really growing and drifting to the north. It's not long enough to be sure if there's no more smoke pouring out, or if this is a pause or change in winds. Either way, it suggests an attack right in that area. 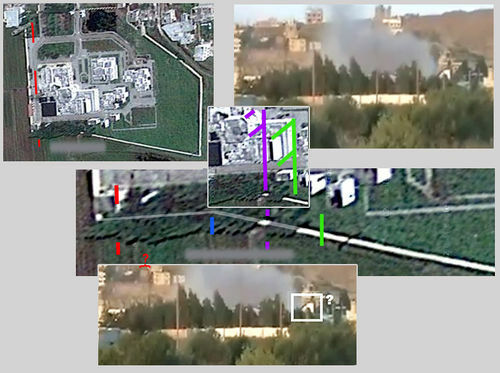 Whatever it is, smoke is visible in two other videos of the same time, from different lines of sight including the hospital. 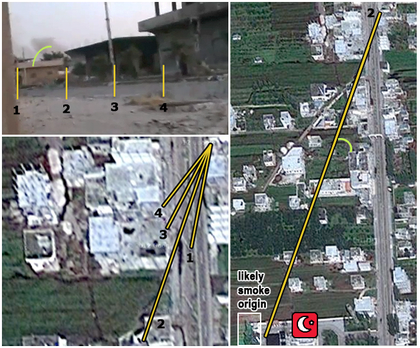 At 0:10 in Monther Hrfosh's related video (filmed 100 meters south), a lesser amount of smoke can be seen, lining up roughly with the hospital or just south of it. Another rebel video, posted in mid-June but apparently (though not certainly) filmed during the clashes of May 25, confirms the location. It was filmed from the mouth of the alley at 720E on Main Street, at just moments before sunset (so around 7:35 PM). As the camera looks south (left) down Main Street during this low-level fire-fight, we can see plumes of smoke billowing up in the mid-distance (0:40), as seen in the graphic at right. All visual cues here match with the view chosen compared to Google Maps' imagery, leaving almost zero room for doubt over the camera position. The smoke looks darker here, as if there was indeed a fire inside the hospital by then. Considering all three videos together, we have three-angle confirmation of an attack on the hospital, suggesting perhaps the dramatic change in management there which some witnesses allege. It seems most likely the earlier videos shows initial rocket attacks that started the real fire we see pouring smoke minutes later. The mobile unit stationed at the Qaws (arches) is not really specified by anyone. The UN's investigators felt it, and everything south, must have held through the evening. But sandwiched between between military intel HQ and the hospital to the south, it may have been positioned to be attacked from both sides. 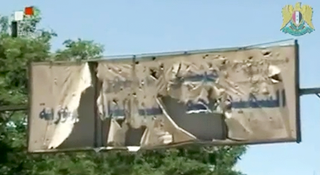 On May 26, the southern face of the arches are marked by bullet holes (see Houla:Scene#The Arches. As the only post capable of driving away, it may have both avoided being overrun while also becoming ineffective as a security post, by virtue of driving away for their very lives. Some of the horizontal "shelling" damage was at sites reported as or confirmed as the same place where families were massacred that day. For example, a Houla activist video of October 1 revisited one of the purported massacre sites, a small two-story home the host says witnessed a "horrible massacre." A visual analysis of the surroundings confirms this is one of the homes in the Abdul Razaq massacre area on Souuth Saad street. (see Houla:Scene#Abdul Razaq crime scenes) This house has extensively holed walls and intact roof. 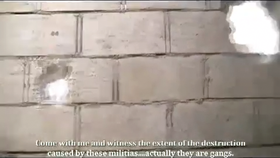 In fact, following the camera in from the side door, the small holes shown here (see inset) are punched into the wall facing Saad street, perhaps by heavy AA rounds fired from a close distance. The tour guide says the holes are from the "Shilka shells ... which rained down on this home." The shockingly young and numerous Abdul Razaq victims were taken from this area to the rebel mosque in the north of town late on the 25th, but many other bodies were left behind, perhaps unrecoverable due to government control. The most widely seen of these is the family of Aref Al-Sayed on Main Street. These were claimed by the rebels, and the following day (May 26) their hand-over from government forces was negotiated by the UN monitors. Others were retained by the authorities with no apparent rebel claim. The exact victims and their locations aren't totally clear. "They began with hitting the houses with guns, machine guns, then with the RPGs, in order to make holes in the houses. They made those hole in order to enter the houses. After this, they killed the people in the house and deformed (mutilated) their bodies. And you are going to see some of these deformed bodies. Some bodies have been burned. They burned the house (unclear), with shells, and then moved to another one." ↑ As the world dithers over Syria, shocking evidence of an entire family massacred by Assad thugs: Father finds his wife and five children among the victims of the Houla atrocity By Nabila Ramdani and Ian Gallagher. The Daily Mail, June 9, 2012. This page was last edited on 23 May 2018, at 12:38.